Bitten by that creative Spider: How to make Homemade Ricotta Cheese - simple and fast! All you need is 1.4 litres of milk, 200ml of full cream, the juice of at least one lemon and half a teaspoon of salt! Heat milk and cream in a saucepan to 38C/100F. If you have nothing to measure the temperature, try a drop on the back of your hand. If it feels like there is no temperature difference between milk and your skin, you have about the right temperature! Take pot off heat and add your 1/2 teaspoon of salt and stir well. Line a sieve with your cheese cloth ( or in my case I up-cycled a baby burp cloth) and place it over a jug, that can hold a good litre of whey! Carefully pour your curdy mixture into your construction made of sieve, cloth and jug. Let drain for roughly 30 mins or longer if you like it more solid. You can help the draining by putting a weight on the top of the closed cheese cloth. The weight will push the whey out of you ricotta much faster. And your homemade ricotta cheese will be ready to use in no time! I have to say I really like the taste of the homemade ricotta cheese. It has been a while since I had shop bought one, as I don't use ricotta very often, but I think after today we will be using it a lot more in our kitchen. 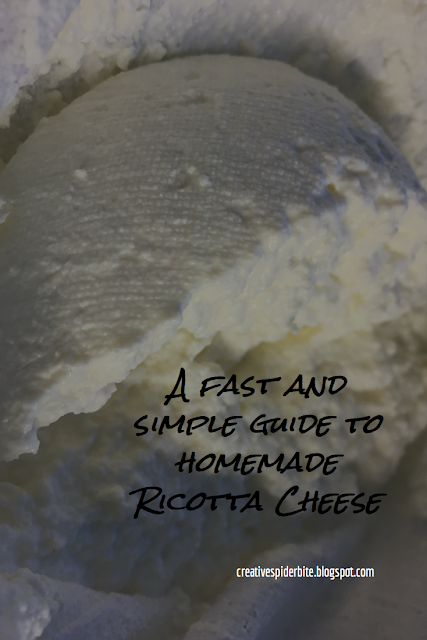 I hope I could help you out with this very fast way of getting ricotta and you get to enjoy the homemade ricotta cheese. Thanks Jaqueline for stepping by, and I hope it works out as well for you as it did for me!